*Please NOTE: Be sure to check ratings before viewing any of these New "Made-for-TV" Movies with your family. Also, there is a possibility that titles and premiere air dates may change, so please check back for any updates. From Friend to Fiancé - Date Unknown? An Aurora Teagarden Mystery: Title Unknown - Premiere Date ? Hallmark Channel’s Christmas Keepsake Week airs July 13, 2018 through July 30, 2018. Countdown to Christmas: 22 All New Movies Coming!!! 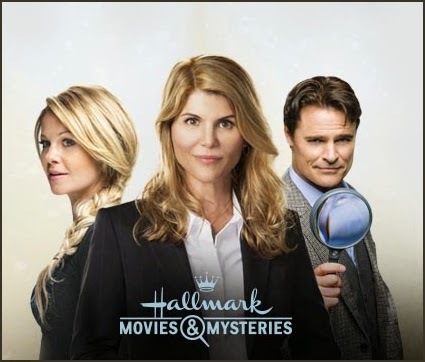 Hallmark Movies & Mysteries Gold Crown Christmas programming block ran from June 29, 2018 to July 15, 2018! Christmas: 15 All New Movies Coming!!! If you are looking for more movies, then please visit the Christmas Movie List - click here! Any chance of more "Goodnight for Justice" movies being made? Last night my husband & I watched "This Magic Moment" on the Hallmark channel, and we thoroughly enjoyed it. It was a sad, but sweet movie. I haven't seen any of the actresses, or actors, but I thought they all did a great job. I appreciate all the wonderful news you send out about all the different movies that will be coming on, and the ones that are on DVD. I hope you have a wonderful weekend and may God bless you. I love your site and have watch some great movies because of your work. I realized today that there are movie on the ION channel, specifically new Christmas movies. I was wondering if you could add them to your list? This movie list is great! I refer to it all the time to see when the next new movie is coming up. Thank you for all you do! Hi Net, I follow both Candace Cameron Bure and Miranda Frigon on FB, and they posted a picture of themselves announcing that filming on Aurora Teagarden #3 is underway, and 3 and the 4th Aurora movie will be filmed back to back! Another awesome find!!! I saw Candace's tweet and I'm super thrilled we will have more Aurora Teagarden Mysteries to look forward to this summer!!! You are so sweet to share... Thank you bunches, Jill!!! I saw on Hallmark Moves and Mysteries that Flower Shop Mystery: Snipped In The Bud is on the schedule for April 24th. That is an awesome find, Becky. I just visited the site to see it! I will be sure to add that date above. Hmmm? I wonder if there will be other Mystery Movies premiering around that time, too? Love your site and am glad I came across it. Thank you! The Convienent Groom and The Wedding March are also currently filming. Can't wait to see them all! Thank you for the update. I added a note under the post title to let people know, if a date is not written next to a movie, then it may premiere this year or next year! Thanks so much! Hope the one titled Curveball is Curveball Christmas which Hallmark advertised as being in the 2016 Christams Countdown and then ditched after it was said to be in production. Rather early to be filming for next Christmas but maybe it might be the "summer" Christmas movie. It is *probably not* a Christmas movie anymore, however. That is my guess. Just as Hallmark has done with a few other movies this year, they probably removed the originally intended Christmas theme and re-themed it to one of their other movie events (they did this with "My Summer Prince," "Love at First Glance" [formerly "A Worthwhile Life"] and "A Royal Winter," to name a few). "Curveball" is most likely a movie for the Spring Fling event, and not for Christmas. I could be wrong, but that is my hunch. But... as far as when Hallmark films Christmas movies, they made 27 of them this year. They had to film them all throughout the year. For example, "Love Always, Santa" was filmed in January of this year. "Falling For Christmas," which was originally supposed to be a Hallmark movie but ended up with UP, was filmed in February. There is a larger concentration of Hallmark Christmas movie shoots in, perhaps, May through July and then in September and October, in particular, but they are filmed all year long. There will probably be a few random ones filmed in the first few months of the year -- especially if they are planning on increasing the number of Christmas movies in 2017. Other Christmas movies -- that end up with other networks -- sometimes film a year in advance (like in December of this year, intended to air in Nov-Dec of 2017). Hallmark does not typically shoot the majority of their Christmas movies a full year in advance, but they might start as early as late January... and then wrap up the last Christmas movie shoot in early November - and get them all on their channels in the same year. As for the other themed events -- Winterfest, Countdown to Valentine's Day, Spring Fling, June Weddings, Summer Nights and Fall Harvest -- those movies usually go into production about 2 or 3 months before they are supposed to premiere on the channels. Oh, and as far as the comment above -- "Second Time Around" and "Walking the Dog" have already been filmed. I have mentioned them in a couple of places under a couple of different blogs) here on this site, complete with the names of the actors in the cast, and have said that they will be part of the Countdown to Valentine's Day. "Second Time Around" (the new/alternate title appears to be "While You Were Dating") stars Billy Baldwin, Stefanie von Pfetten and Michelle Morgan. It was directed by David Winning. "Walking the Dog" stars Jennifer Finnigan, Lini Evans, Peter Benson, and *I think* (not 100% confirmed yet) Sam Page. The other Valentine movie that was already filmed is "A Dash of Love", a.k.a. "A Pinch of Love," starring Jen Lilley, Brendan Penny and Peri Gilpin. It was directed by Christie Will. There is no confirmation of "Campfire Kiss" and "Love at First Bark" being Hallmark movies -- meaning Hallmark has not announced them, and since they have not yet been filmed, the actors in the movies have not yet had a chance to say they are doing Hallmark movies. But... chances are, they are Hallmark (I have been watching those titles for a couple of weeks as well). There have been movies made in the past that seemed like Hallmark and were even said to be Hallmark by cast and crew... and then ended up not being Hallmark. I just noticed that the Countdown to Valentine's Day premieres are appearing on the Hallmark Channel website. And there is a surprise movie in there that flew under the radar (it is a surprise to me -- maybe not to you)! First of all, "An Uncommon Grace" is going to premiere on HMM (I knew it wasn't a movie for the main Hallmark Channel, but I was starting to wonder if it was going to UP or another network instead) -- on Sunday, February 12th. After the premiere of "Love Locks" on Saturday, January 28th, I can't find a new movie scheduled for Sunday, January 29th -- which is strange. Maybe there is one, but I just don't see it yet. Valentine's Again -- Saturday, February 4, 2017 -- This is the one that flew under the radar. A total surprise for me. So, all of the movies that I mentioned on this site, as part of the Countdown to Valentine's Day, are there, and the casts that I mentioned are in them, BUT Hallmark threw in a surprise with the movie that is premiering on February 4th (again, it is a surprise to me -- maybe you knew about it). AND they are doing a weird thing with the schedule in that they are premiering new movies on a Monday and on a Tuesday. And... I have no idea if anything is scheduled for Sun., January 29th. Net -- After yesterday's shocking discovery of the Valentine movie that flew under the radar (mentioned in my comment above ^^^), I poked around and found that it was filmed in Bulgaria!!! No wonder the movie "Valentine's Again" flew under the radar -- it is starring an actress who is new to Hallmark (Nicky Whelan), so I wouldn't have known to check on what she was doing, and it was filmed in an area I would never think to monitor for Hallmark movie shoots! Romania is always a possibility (since that's where all of the royal movies for Hallmark are filmed), but I don't think they have ever filmed in Bulgaria... have they?? Not recently, in other words. Anyway, I am still trying to figure out if there is another surprise movie coming up on Sunday, January 29th. If there isn't, this would be the first time in a while that Hallmark did not have 2 new movies on the last weekend in January, to kick off the Countdown to Valentine's Day. And you know what? Now that I think about it... quite a while back there WERE a couple of movies that were being filmed, not at the same time, which either had Valentine in the title, OR some sort of indication of a Valentine theme. In one case, the movie was said to be Hallmark by a random crew member -- but it didn't look Hallmark-ish to me. It seemed more like it could be ION's annual Valentine movie. BUT... those 2 movies (one of which may have had Kristy Swanson in it) were filmed long enough ago that they did not seem like they could possibly be Hallmark Valentine movies, as Hallmark generally films the Valentine movies later in the year. The other movie (not the one with possibly Kristy Swanson) may have been filmed in Kentucky or Texas -- I honestly can't recall. It seems like it was so long ago, and all I knew was that, judging by the timing of the filming, there was no way these 2 movies could be Hallmark Valentine movies. But now that it seems like there could possibly end up being another surprise movie on January 29th... I wonder what it could be and where it was filmed? Paul Greene and Danica McKellar are starring the Hallmark Channel movie, "Campfire Kiss" -- I had been keeping my eye on that one, waiting to find out who was in it. I just discovered this info a few minutes ago (Monday night, January 2nd, 9:30 p.m.). It has got to be a Spring Fling movie. Wow! That is all exciting movie news, Sherry! Can't believe how soon Valentine's Day is around the corner. I'm still taking in all the movies ahead... how fascinating that Paul Greene and Danica McKellar are doing another movie together. I'm not usually a fan of that, but it didn't bother me, at all, with Lacey Chabert and Brennan Elliott or Alicia Witt and Gabriel Hogan. But, it did somewhat with Autumn Reeser and Antonio Cupo - since they didn't get together in I Do, I Do, I Do. Anyway, great finds, as usual, Sherry! I will be sure to post them as soon as Hallmark sends out official press release. Thank you so much for sharing, Sherry!!! Thank you, Net! Happy New Year to you as well! I am happy to share my movie findings with you! I do hesitate to post some things here on the site, because I can tell that people are viewing your site as an official Hallmark news source and are going to Wikipedia to post things on Hallmark's page that *may or may not* actually be Hallmark, or that may or may not happen -- things that neither Hallmark nor any credible, trustworthy Hallmark source has announced. I really prefer telling you of my discoveries via email instead of here, but I think you are or were getting bombarded with emails and/or bits of info at one point -- much of it the same info or repeated from other sources who found it -- and I didn't want to keep contributing to that unless there was something really significant to pass on. It seemed to be getting overwhelming for you, and I didn't want to pile on to that! So I have been saving up all sorts of tidbits and discoveries! I don't think the Paul Greene/Danica McKellar movie info will be press released for a while longer, since it is most likely a Spring Fling movie (which could mean it premieres anytime from March through May). Or... it is a very, very early production of a Summer Nights movie. But Paul, Danica AND Barbara Niven have all said they're doing a Hallmark Channel movie, and both Barbara and Ali Skovbye have referred to it as "Campfire Kiss," while Danica called it (on Periscope) "a campfire movie." And Danica and Paul both shared a lovely photo of the two of them together from the set of the movie yesterday. So I think it's safe to report that one. With people like Paul, Danica and Barbara, we know we can trust them when they say they are doing a Hallmark movie. We know for sure it's Hallmark. AND we know that if they are actually freely tagging Hallmark in all of their posts about it, Hallmark must have given them the green light to talk about it -- or they at least did not insist that the actor stay silent and mysterious! The 6 Countdown to Valentine's Day movie titles and premieres (1/28, 2/4, 2/11, 2/12, 2/13 and 2/14) are all on the Hallmark Channel website (though I know dates can change). The only one I didn't know about as it was filming is "Valentine's Again," with Nicky Whelan, Greg Vaughn and Marina Sirtis -- because it was filmed in Bulgaria. Since I found the title on Hallmark's site, I have since looked it up and found a bunch of photos from the production. 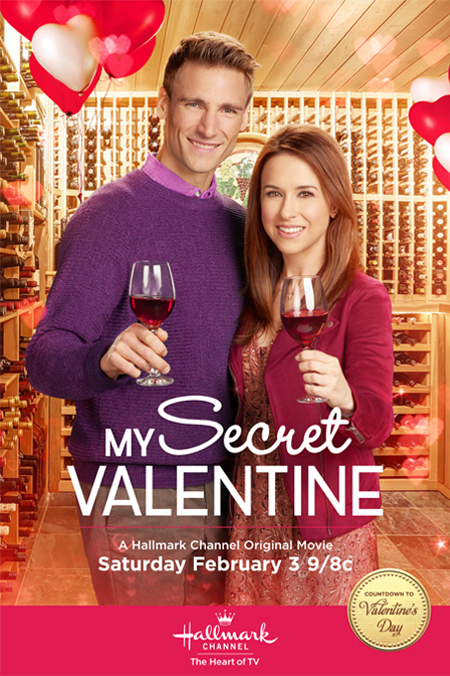 Other than that one, all of the other 5 Valentine movies I mentioned here are on Hallmark's site as well -- and the cast members that I previously revealed (Jen Lilley, Jennifer Finnigan, Sam Page, Brendan Penny, Billy Baldwin, Stefanie von Pfetten, etc. ), are all listed on the Hallmark site). Michelle Morgan is not listed with the "While You Were Dating" (formerly known as "Second Time Around") synopsis on the Hallmark page, but she IS in the movie, as first reported by director David Winning (and later confirmed in a couple of photos from the set). Once I got the confirmation of "An Uncommon Grace" being a Hallmark Movies & Mysteries Movie and its premiere date (2/12), I tried to find more photos posted online, and found very, very few -- I couldn't find any additional photos beyond what I originally found when I searched the title (before knowing for sure that it is an HMM movie). Sean Faris posted a couple, but that's about it. Jes Macallan didn't post much of anything other than one photo. To that end, I love Lacey and Brennan together in anything they do. I think they're adorable. I liked Alicia Witt and Gabriel Hogan together as a couple much better in "Christmas List" than in the first movie they did -- although I enjoyed Christmas at Cartwright's" as a movie. I still think that Alicia's perfect leading Hallmark man has not been discovered yet. It could be someone already in the Hallmark family, who just has not worked with her yet, or it could be someone new. I liked Andrew Walker and Arielle Kebbel much better together in "A Bride for Christmas" than I did in "Bridal Wave." Anyway, yes, we have a lot of movie fun ahead of us this year! Seeing that there are supposedly 85 movies that Hallmark wants to premiere this year (between both channels), we have a LOT to look forward to! They're already making progress and cutting into that "85" number -- the Winterfest movies have been filmed; the Valentine movies have been filmed, the new January/February movies for HMM have been filmed; the Paul Greene/Danica McKellar movie is being filmed; the next Aurora Teagarden movie is being filmed, etc. But there is still a long, long way to go! We can assume that at least 27 of those "85" planned movies are going to be Christmas movies, because I can't see Hallmark taking a step backwards and making fewer Christmas movies in 2017. If anything, they will probably make a couple of extra ones to add to the HMM line-up. I just typed a long message earlier this morning (immediately before the one above that starts with "Also, I wanted to add) in which I was talking more about Paul Greene, Danica McKellar, Ali Skovbye and Barbara Niven all mentioning working on a Hallmark movie ("Campfire Kiss") and tagging Hallmark in their posts. I don't see the message. Did it not go through? I found it, Sherry. For some reason - it was automatically placed in the spam comment folder. You are so right, I have been overwhelmed with emails and information on movies, press releases from various sources, etc... so, it is easier when you share via comments. Thank you so much for understanding. I saw a cute on-the-set pic, too, with Paul Greene and Ali Skovbye this morning on Twitter. Sounds like they will be playing father and daughter in Campfire Kiss! Following up on my "Pssst" message above -- my guess was accurate. Lacey is definitely in "Curveball" (confirmed by Rebecca Staab, who is also in the movie - Ioana A. discovered Rebecca's involvement)!!! So, Lacey is making her post-baby return to Hallmark! If "Curveball" and "Campfire Kiss" are being lined up for Spring Fling, this is going to be a very strong Spring Fling event. The casts of each movie are quite good. Saw Lacey tweet about "Curveball." Thanks so much for discovering & sharing, Sherry! The pics she shared showed snow... do we know, yet, if it's still Christmas themed? Love At First Bark will be filming this month in Canada; it's probably Hallmark Channel Movie. Yes, I've been keeping an eye on it for weeks -- in fact, it has been mentioned on this site before, in the comments. We're on top of it, don't worry! No -- not 85 Christmas movies, and not 88 Christmas movies. There is no way Hallmark would more than triple the number of Christmas movies they make in a single year. It's impossible. Hallmark is planning (as per Michelle Vicary and Bill Abbott) for 85 movies in general this year (spread between the 2 Hallmark channels), up from about 77 last year. That includes Winterfest, Countdown to Valentine's Day, Spring Fling, June Weddings, Summer Nights, Fall Harvest and both Christmas Keepsake week AND the Countdown to Christmas. It also includes all of the mystery movies on the Hallmark Movies & Mysteries Channel, and any other non-mystery movies made for HMM. They could always get ambitious and decide to go for even more than 85 movies this year, but not Christmas movies, specifically. Included in those 85+ movies will be at least another 27 Christmas movies, I think (they're probably not going to make fewer Christmas movies in 2017 than they did in 2016, which is why I am saying that I think there will be at least another 27). The ultimate goal -- again, as per Michelle Vicary and Bill Abbott -- is to get to 29 Christmas movies by 2018. They're practically already there. All they would have to do is make one extra Christmas movie this year, to bring the total to 28, and then another extra one next year to bring it to 29. But there will be at least 58 movies made for/by Hallmark this year that are not Christmas movies, and those will fill out the rest of the "85" number beyond the 27+ Christmas movies. "She directed her first movie for Hallmark last Christmas. She's a great director and she's directed a lot of music videos that she never took credit on. I say to her, "You don't have to hire a director, you are a director, you're a creative director." Hallmark gave her a three-picture deal - we've just been too busy to make the second movie. We were supposed to do a film for this Valentine's Day but we've been so busy, we had to push back the production with the announcement of the Lionel Richie tour. Mariah's 3-movie deal supposedly did not include "A Christmas Melody." The 3-movie deal was announced quite a while after that movie premiered (I think Hallmark wanted to see how the first one did before doing anything else), and the first of the 3 movies was supposed to originally be a 2016 Christmas movie... which then got changed to a 2017 Valentine movie. I had my suspicions that these mysterious 3 movies would not be happening for a while (if ever)... but can you link "the interview" for us (the one with her manager)? I haven't seen this interview, and I'm sure Net would like to see it too. I could be way off base, but something tells me that one party or the other -- either Mariah or Hallmark -- might be trying to get out of the deal that was made. I know that Mariah is busy -- but it's not like she didn't know she was busy when she made the 3-movie deal with Hallmark. She knows that anything could come up at any time -- tours, TV shows, whatever. That's just part of her life. She signed on to do 3 movies (and these Hallmark movies do not take long to film -- usually 3 weeks) and probably later realized she didn't want to do them. That's my guess, in any case. I'll be surprised if we see anything else from her on the Hallmark Channel -- meaning a newly-themed movie -- this whole year and into next year, if at all. Beginning to look like Curveball could be the infamous Curveball Christmas which was announced as having started production earlier in 2016 and then mysteriously vanished. The plot could easily be altered from a Christmas theme. If they wished Lacey Chabert to star in it then she would have been into the second half of her pregnancy when they announced this and the postponement could have related to this. At times during A Wish For Christmas the pregnancy ws very noticeable and I found it offputtting. Yes, isn't this great news! I'm also wondering if this is still Curveball Christmas??? Would be rather nice to have a Christmas movie actually filmed with real snow! I'm also wondering... Could this also be a Christmas Keepsake movie for Hallmark in July??? As for A Wish For Christmas with Lacey, I agree with you in that the hiding of the pregnancy was sometimes distracting. Fortunately, the movie itself, was still very cute. I'm watching Chasing Leprechauns (2012) on Hallmark Movies & Mysteries; it's only one movie for St. Patrick's Day. I saw those dates/times on Hallmark's web-site. I'm not sure all of those times are the actual premiere dates, yet, for all of these movies. I am in contact with Hallmark, so I'll be sure to list the premiere dates above when they are official. I wonder if countdown to Valentine's Day movies have been changed because Love At First Bark will premiere on February 4, 2017 while it's start filming in Canada on January 12, 2017. Anything is possible!!! Hallmark is generating so many movies so quickly - trying to squeeze them all in the schedule at just the right time is probably a puzzling task! First of all, we don't have confirmation that Love At First Bark IS a Hallmark movie. Not even a shred of proof other than a single title. People are way too quick to jump on titles and assume they are Hallmark movies without having any info to back it up. There have been many false alarms -- just in 2016 alone, not to mention other years. Net, you know that I always investigate and dig up info to support my findings, and there is nothing to support LAFB being a Hallmark movie right now. Personally, I am quite certain it IS Hallmark, but there is nothing to support my guess. In one week there might be more info, but not right now. I've been following the title for weeks, and there is nothing as of this moment. Second, IF Love At First Bark were to start filming on January 12th, there is NO WAY it would premiere on February 4th. No way. These days, Hallmark movies take about 3 weeks to film -- give or take a few days. There are sometimes delays. It would be impossible for Love At First Bark to start on January 12th and be on Hallmark on February 4th. At the absolute earliest it would wrap up filming on January 26th -- that is the earliest date. More than likely it would wrap up closer to February 2nd. After filming wraps, editing and other post-production work has to be done, including the actors being brought back in a couple of weeks later to do ADR work and re-record dialogue. Now, could the movie end up airing in late February, after Valentine's Day? Sure. I suppose. But I am guessing that March or April is more likely. If the movie had begun filming sooner than January 12th, there might have been a chance. But the timeline would not work for a February 4th premiere as it stands now. Third, last time I checked, Love At First Bark did not have a filming end date listed. When that happened once in the past and a movie was listed without an end date, the whole filming schedule ended up changing by a few days. Fourth, there is already a "dog movie" in the Countdown to Valentine's Day -- and that is "Walking the Dog." "Love At First Bark" sounds like a dog-focused movie. Fifth -- Spring Fling movies film in January, or at least they start in January, even if they carry into February. Valentine movies film in November-December. Now, I have no idea how many Spring Fling movies there will be this year, and if they will premiere in March or April. There will be at least 3 movies, and who knows if they are adding in more? But now is the time when the Spring Fling movies should at least begin filming, and there *may* be one or two that film in February. Hallmark may do something like air a couple of "bridge movies," that fill in the gap between the Countdown to Valentine's Day and Spring Fling, or they could just make a bunch of movies and call of them "Spring Fling," even if they span March, April and May. But we wouldn't see them any earlier than late February and more than likely March/April. Sixth -- Hallmark already has 6 movies lined up for the Countdown to Valentine's Day. One of those movies will end up on February 4th, and one will end up on February 11th. There is no need to add in a 7th movie just to fill in February 4th or 11th, when they have enough movies to do that. They're not going to premiere 2 movies on February 12th, nor will they premiere 2 movies on February 14th, but that is what the current wacky schedule is showing (because "Love At First Glance" is premiering on 2/14 as well). I don't like the same lead actors being paired more than once no matter how good they were together. For example Jessica Lowndes and Daniel Lissing were awesome as Layla and Seth in A December Bride. That's how I will always remember them and it wouldn't feel right if they were to appear as a different love interest. But I really hope to see both of them in many more Hallmark Movies. Sherry, I meant that response in fun! Hallmark is pretty amazing in turning out these movies, virtually over night, it seems! So, we will wait patiently and see when everything falls into place. Anonymous, I agree with you... I mostly enjoy new couples together. When we see many actors repeated in Hallmark movies - at least it's nice to see them with a new co-star. Net, I just love your blog. Your responses to everyone who comments really shows your kindness and patience. Thank you for always letting us enjoy each season of movies and not pushing us into the next. I always enjoy your site each day, but most at Christmas, because I love that time of year. As for the new movies coming to Hallmark this year, my take is they will come as they may...and let us just enjoy having family friendly movies! I love your perspective...Anything is Possible! I must admit, I love the Christmas movies best, as well, but it's fun throughout the year, too! Every season brings new joys! I'm sorry, but I don't like to let people think that something is possible that is not possible -- and that includes a movie airing on a specific date, only days after it completes filming. Since the movies will come as they may, I am more than happy to not share any of my info or findings here in the future. Sherry, I hope you know I always appreciate you sharing movie information. I’m always fascinated to hear all the movie news that you & others take the time to come here and share with the It’s a Wonderful Movie family! Also, I hope you know my heart, as I certainly would never intentionally mislead anyone. Watching GSM: Art of Murder, and a new GSM ad showed up, and they're will be FOUR all new GSM movies in August! Yes! Isn't this exciting/intriguing news! An anonymous commenter first alerted me to this news after they saw a video on Hallmark's site. Honestly, I thought it was too soon for Hallmark to reveal such news for August! But, they did! Should be interesting to see what this means for the Garage Sale Mystery series!!! Thanks so much, for making sure I heard this news, Jill! I just created an Upcoming 2017 New Movie post - so we can all share this news together! I can't find the original blog you had up, Net, under which we were giving info we find about the new non-Christmas movies coming this year (that's where you had the photos from Campfire Kiss and Curveball, for example), so this was the only place I could post where it would make sense. Under that other blog, someone posted once or maybe twice, to say that Paul Campbell was the male actor in "Love At First Bark." Unless Paul has a cameo in the movie, that is just not true. I don't know where anyone got that idea. "Owen" is the name of the male character in the movie, and Kevin McGarry is playing Owen -- not Paul Campbell. Both What's Filming AND IMDB have Kevin McGarry listed in the LAFB cast, and IMDB says that Kevin is playing Owen. Paul Campbell is currently in L.A., while Love At First Bark continues to film in Canada. There were so many projects announced at the TCA event, it didn't make sense to keep that previous page up, and I decided this format still worked best for me. As for "Love at First Bark," I also saw the cast list for it on the What's Filming web-site. It's unfortunate that Paul Campbell isn't in it - since he has such a great on screen personality, but I'm sure all the actors in it will be great, too! I just wish that people wouldn't announce that someone is in a movie without either stating where, exactly, they found the person's connection to the movie (they can tell you behind the scenes if they don't want to post it here for everyone to see), OR saying something like "I can't say how I know, but so-and-so is definitely in the movie." The Paul Campbell info -- again, unless he has a cameo in Love At First Bark -- is completely incorrect, as of this moment. Ever since the anonymous commenter mentioned Paul's name here, Ioana and I had been trying to find evidence to support Paul being in the movie -- because we just did not see anything to back it up. Even the people at What's Filming were trying to figure it out behind the scenes. NO ONE found Paul in the movie -- and now it turns out that someone else is playing the role of Owen (Ioana found a Snapchat video with Kevin in it last week). When I post something about someone being in a movie, you know that I have taken reasonable measures and followed solid paths to come to that conclusion or to make that discovery. I generally do not post here on this site about who is in a movie unless I am 100% certain, or at least 95% certain -- because I have put all of the pieces together and figured it out. I'm going to go out on a limb and say that I am pretty sure that the upcoming movie "12 Days" (starting production at the end of February) is a Hallmark movie. There are a few indicators and clues that I look for when assessing whether or not something is going to be a Hallmark movie (if it has not already been announced as being a Hallmark movie). I won't list them all here, but "12 Days" meets some of that criteria. The question is... will "12 Days" be a late Spring Fling movie (potentially airing in May), an early June Weddings production, or a Christmas movie ("12 Days," as you will recall, was one of the alternate/working titles for Meredith Hagner's movie, "My Christmas Love")??? Now that 2016 is well past these were my top 10 TV Movies for the year (not just Christmas). Im not saying that it was a bad movie but with two of my favourite actors in Lacey Chabert and Paul Greene my anticipation was high and I probably expected too much - the romace element was curiously muted. The least said about this the better but it was pretty poor on all fronts. I'm intrigued as to who the lead characters will be in The Wedding March 2 (sequel). Jack Wagner and Josie Bissett will be starring in the sequel to "The Wedding March," but there will most likely be other well known Hallmark actors/actresses involved! Both Jack and Josie will also be starring together in the upcoming Season 4 of "When Calls the Heart." Jack Wagner and Josie Bissett are the lead characters again. There may be a secondary story too (featuring the supporting characters), but the movie is presumably continuing their specific story. Maybe Jack and Josie are the ones getting married in the movie this time around? Don't know what to expect here - as far as I was concerned Mick and Olivia had gotten their happy ending which is why I thought the main story might be about one of the daughters. Both Jack Wagner and Josie Bissett were excitedly talking about this sequel movie to "The Wedding March" at last summer's 2016 Hallmark TCA event - so yes, they will be in it! They are both pretty big stars - so I'm sure much of the movie will be about them and most likely, the ups & downs before their wedding, since it will be premiering in June during June Weddings! In the movie, though, they both have daughters - who may also have a story of their own along the way! "Not far behind (Spring Fling), here comes the bride with “June Weddings,” a month-long celebration of all things love and matrimony, including “The Wedding March 2,” the follow-up to last year’s hit with stars Josie Bissett (“Melrose Place”) and Jack Wagner (“The Bold and the Beautiful”) reprising their roles." It should be interesting to see where this movie takes all of their characters! Thanks for commenting! I still think the supporting characters (like the daughters, or maybe even Aaron Pearl's character) might have a secondary story, but there is no doubt that Jack and Josie are the stars/leads. As Net said, Jack and Josie were at the July TCA event in 2016, to happily announce (with Bill Abbott) that there would be a second Wedding March movie. I'm very uneasy about this but there's no point in worrying until I see which direction the sequel takes. I appreciate your movie curiosity - as it can be fun exploring ideas and wondering which direction a story will take! June will probably be here before we know it, and then all will be revealed! The story, wherever it leads, has already been written. You are always welcome to share your thoughts and questions here! As a matter of interest how big a budget would a Hallmark Movie have? How much woud the leading actors get $50k? Maybe too low? Oh yes, I've been a follower of "What's Filming" for some time! You are so sweet to share -- because it's a terrific source! I frequently check in there for new movie titles, cast details, etc!!! Oh, and I have referenced What's Filming on my "Upcoming Christmas Movies Page." Thank you, again, for being so thoughtful!!! Net -- Since you noted above that Spring Fling starts on April 1st, I am assuming you saw that Lacey's movie, "Curveball" (or whatever it is ultimately going to be called) is part of Spring Fling (which is exactly what I expected). A clip of it is featured in the Spring Fling preview running on the Hallmark Channel, along with a clip of Jana Kramer's movie. Danica's movie was not shown in the ad, so I can only imagine that Hallmark is putting her movie in a March slot just to have *something* new in March other than only When Calls the Heart. Otherwise, if March were not so empty and lacking in new movies, I think Danica's movie could easily just premiere in April. Yes, I saw the new Spring Fling commercial with Lacey Chabert! I'm so interested to see how "Curveball" (if that is still the title) will fit into "Spring Fling" ... especially since it was originally - I assume the Christmas movie "Curveball Christmas" and since they filmed a lot of their scenes in real snow! Should be interesting! I, too, wish they could have placed "Campfire Kiss" in Spring Fling. I'm not too fond of when they do movies in- between themes. I like everything in order and in it's place! It's a dilemma, for sure. We either end up with random, straggler movies in between themes -- even if the movies *seem* like they should belong to a theme (such as "Tulips In Spring" last year, which premiered after Spring Fling was over), OR we end up with a long gap of time with no new movies. As it stands now, it looks like there are no new movies on the main Hallmark Channel in between "Love Blossoms" and "Campfire Kiss," so that is a good month without new movies. That's when a lot of the momentum will be lost (which was built up starting in October last year and continuing all the way to now). Some people only tune in for movies and not for the series, so there will be a big void when we hit a long stretch without new movies. And then after Campfire Kiss premieres (assuming it stays on March 18th, which may not happen), we have another couple of weeks before Spring Fling starts. At the moment it is looking like there will only be 3 new movies in April again -- unless another previously unknown title suddenly emerges from the shadows. That's what they did last year -- 3 new movies in April. There should be 4 or 5. And then we might end up with another straggler/in-between-themes movie or two in May. I was hoping Hallmark would not do that to us this year. Seems like they are! !Already don't like the gap between Love Blossoms and Campfire Kiss. But better than last year. Sorry yall but I have to disagree about the stragglers or in between themes as long as we get new movies and not a huge gap I am fine with it!! Like Tulips in Spring I thought it was a Spring Fling movie and Date with love was the stragglers so evidently didn't even notice or didn't care because was getting a new movie. Last year the gap seemed to take forever between Valentine's and Spring Fling then again between June Weddings and Summer Nights. Thought since Love Blossoms and When Calls the Heart premiered same weekend and then Campfire Kiss already announced for March that more might come on in March and no huge gaps like last year. Ideally, what I would like -- just to make it easier -- is for Hallmark to extend the Spring Fling event so that it covers part of March, all of April and at least half of May. Within the context of "Spring," they can throw in flower-themed movies, baseball-themed movies, Mom-themed movies, prom-themed movies, and anything else that is associated with Spring, --but just lumped into one big event. Last year, the new movie schedule in Mar-Apr-May was wonky. First of all, we really did not get any new movies in March on the main channel. They did premiere Part 2 of "The Bridge" in March, but they had already shown it on HMM the week before, so I don't even really count it. In my mind, they went the whole month of March with no new movies. Then... Tulips in Spring was not officially part of the Spring Fling event, oddly enough. That made no sense at all. Last year's Spring Fling was originally supposed to include 4 new movies in April. That's how it was first advertised. Instead, later Hallmark decided to shorten it to only 3 new movies -- again, only in April. March was not included in Spring Fling and May was not included in Spring Fling. So they skipped over March. Then, they showed 3 new movies on the first 3 Sundays in April last year. Then, after Spring Fling ended they skipped another 3 weekends -- no new movies for 3 more weekends in a row. Too long. In mid-May, they returned with "Tulips In Spring" on one weekend, and "Date With Love" on the next weekend. They skipped another weekend in late May. Then on the first weekend in June, starting on the first Friday of the month, they began June Weddings. After June Weddings ended, they only went 2 weekends without new movies, and then picked back up with the new Christmas in July movie. Summer Nights kicked in on the weekend immediately after Christmas in July ended and the new movies continued all the way from the last 2 Saturdays in July to the last Saturday in August. September had no new movies at all. Zilch. It was a complete dead zone. So, to sum up, I can understand the need to occasionally go 2 weekends without a new movie, but going 3 weeks or more is when they lose a lot of momentum. Hallmark should extend Spring Fling to cover more territory, and also extend Fall Harvest to cover part of September too, and then throw in extra movies under those banners (the themed events are good for the purposes of bringing in advertisers and sponsors). There's new Hallmark Channel Movies called; "The Wedding March 3" (Christmas theme) & "Old Acquaintance Be Forgot"
Thank you so much for thoughtfully sharing those titles. I have lots more details on both of those movies- "Old Acquaintance Be Forgot" & "Christmas Wedding March" in my Upcoming Christmas Movie Post! I also remove anything that is incorrectly posted on the Hallmark Wikipedia page -- for example, people keep adding UP movies to the list of Hallmark movies in development, and I keep taking them off the list! lol I don't know why people keep posting those things, but I guess they just assume that any and all Christmas movie titles are Hallmark movies. Are there any additional new movies for March & April? And, more new HMM mysteries in April! Portland interior designer Julia Galvins (Jana Kramer) adopts a dog and seeks the help of expert and handsome dog trainer Owen Michaels (Kevin McGarry). When she is hired to design a nursery and a “puppery,” as well as plan a puppy shower fundraiser for a pregnant client and her pregnant dog, Julia asks Owen’s advice, and their friendship just might turn into something more. Stars Jana Kramer and Kevin McGarry. Yes, I saw that over the weekend! Thank you for sharing! I have a brand new post up on it. "Igniting Old Flames" is a made-for-TV movie that just popped up out of nowhere on What's Filming. It was not there when I checked WF yesterday. It starts production today. Based on the title, it sounds like it *could* be a romance sort of movie. But you never know. It could be some sort of Lifetime stalker movie. These titles can be deceptive and mean a few different things! By the way, I'm pretty sure that "Guest She Found Online" (you have it listed above) is going to be a Lifetime movie. Lifetime has several of those "online" movies, and they are the standard Lifetime fare that you would expect. When I saw "Safe at Home" - I first thought of Lifetime, too, and it possibly referring to someone's security... but, then I had another idea. It may be "off-base"... but perhaps, it could be a baseball movie! Safe at Home - referring to home base! Who knows? Maybe! I'm kind of guessing "Guest She Found Online" will probably be a Lifetime movie, too. It will most likely be dropped from the list. Right after I posted about "Safe At Home", I dug a little deeper, and came to the conclusion that the Safe at Home title IS, indeed, a clever baseball pun -- just as you thought. Looking at the director and producer of Safe At Home, I am pretty sure it's going to be a Hallmark movie -- maybe one that will air in May (you know how there were 2 random May movies last year, which were not officially part of Spring Fling). Guest She Found Online is on IMDB -- and the synopsis makes me think it's definitely a typical Lifetime psycho/stalker story! If Igniting Old Flames is not a Lifetime pyromaniac movie and is something for Hallmark (that just popped up out of the woodwork), it, too, might be poised for a May premiere. Net!!! It's now right around 10 p.m. on Monday night (2/20), and I just made a shocking discovery!!! You know that Cassidy Gifford is supposed to be in "Old Acquaintance Be Forgot," which is filming in Syracuse, NY (also starring Tilky Jones and Katrina Begin, although their names did not appear in that Syracuse article). And you know that Old Acquaintance is a Christmas movie. HOWEVER.... a couple of days ago I figured out the director and one cast member from "Like Cats and Dogs," and I have been waiting for signs of who is starring in LCAD. Guess who one of the actors in Like Cats and Dogs is? Cassidy Gifford!!! Is Cassidy appearing in BOTH "Old Acquaintance..." and "Like Cats and Dogs"? Maybe she wrapped up in NY and flew out to Canada. Or did someone give incorrect info to that Syracuse website, to lead them to think Cassidy is in Old Acquaintance when she is really only in LCAD? And if, for some reason, she is not in Old Acquaintance at all, and it was a big mistake, then is Old Acquaintance really a Hallmark movie at all, or is it another case of a "media" source reporting a Hallmark movie in production that is not really a Hallmark movie? I was reading Like Cats & Dogs article on What's Filming - I notice Cassidy Grifford starred in Like Cassidy. If Cassidy filming both movies Like Cats & Dogs & Old Acquaintance to be forgot who goes back & forth!!!! Thank you bunches for sharing! I just added those two titles above! It's great to hear the new title, too, for the 4th Gourmet Detective movie (although, it is a little creepy!)... plus hearing it will be coming later this year! Thank you so much for sharing! I also just learned, after receiving your comment - that Dylan Neal shared this movie news via Facebook! Awesome finds!!! The Christmas Calendar is listed under More Upcoming Hallmark Movies, but it's for Up. Dylan Neal has a project in development with Hallmark called Truly, Madly, Sweetly. He mentioned it on Facebook, in a post from January 15th. Yes, absolutely - "The Christmas Calendar" starring Laura Bell Bundy is an UP movie! Oh my goodness... Thank you for noticing & letting me know - I removed it from under the Hallmark list! By the way, I have the synopsis & cast list for this movie- HERE! Yes! I'm keeping my eye on the production listings, too! Lots of TV Movies "in the works"! Sites like this share TV movies from all the networks. Some may not be Hallmark or family-friendly, but hopefully the majority of them will be!!! Thank you for sharing. I noticed that article is from 2015. Sometimes, it takes a while for a movie to get into the production phase! Yes! It is such exciting Christmas Movie news! You will find that already posted HERE - at the top of the Upcoming 2017 Christmas Movies!!! Love that Rachel Boston will star in "Angel Falls!" A strong female executive learns the meaning of Christmas through a series of events at a homeless shelter operated by an ex-NHL player in New York. Home for the first time in years for her sister's holiday wedding, Noelle McDowell is forced to face Thom Sutton, the man who jilted her when they were both teenagers. A romantic comedy about a struggling family-owned theatre at risk of being forced out of business by a greedy real estate developer. Josh undertakes the task of convincing the owner to sell by auditioning for Prince Charming in the upcoming production Once Upon A Date. A dishonorably discharged Army Ranger must take over his ailing sister's high end proposal business only to fall in love with one of their clients. A divorced New York cop takes his son on a ride along with him on Christmas Eve. Sometimes love needs a do-over. A woman who make a Christmas list every year is shocked when those wishes begin to come true. Yes, thank you for posting... some of these are "potential" upcoming Hallmark, UP, or PixL movies that I have been definitely keeping my eye on! I'll be sure to add the titles of the ones (currently unknown- as to where they are airing) to the unknown network list above! The movie "While You Were Dating" has already premiered on the Hallmark Channel. I have a post on that one - HERE. Plus, I have page on Campfire Kiss starring Danica McKellar and Paul Greene - HERE! Also - I have some of the Christmas movie titles you mentioned above on the "UPCOMING 2017 CHRISTMAS MOVIE" Page! Thank you for being so thoughtful to share your findings with all of us! Again, thank you, Anonymous... I shared 3 of the Christmas titles you gave us on the "UPCOMING 2017 CHRISTMAS MOVIE" Page! "A Very Mary Christmas," "What I Want for Christmas," and "The Christmas Gift!" I posted the info here first (8:25 p.m. on Monday night, but I am about to tell What's Filming now). Ken Tremblett is in "12 Days." Thank you so much - for sharing, Sherry! I'm so glad my guess on the movie "Safe at Home" being about baseball - was a homerun! 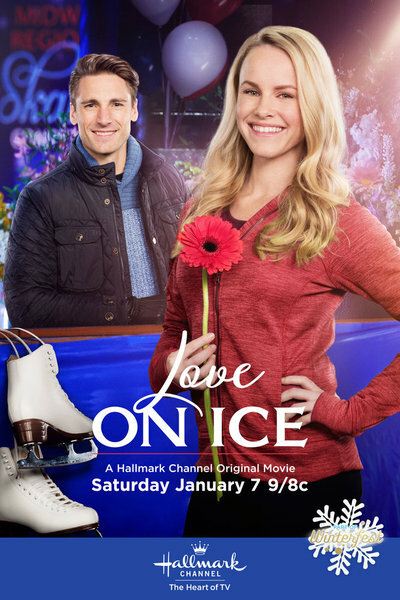 So... Andrew W. Walker goes from Ice Skating in Hallmark's "Love on Ice" to Baseball! Interesting! No problem at all, Net! Yes, your initial thought about it being baseball-ish were spot on (and if there had been any doubt, those shirts shown in the photo give it away!). I wonder exactly how much baseball will be in it. Presumably Andrew will be a baseball player -- who finds love, of course! Maybe that's the extent of it, and there won't be a whole lot of baseball in the movie. Although... there was a lot of ice skating in "Love On Ice," so who knows? Another thought is... since the "Curveball" title is still up for grabs (now that Lacey's Spring Fling movie was re-titled), I wonder if Hallmark might change "Safe At Home" to "Curveball"? They hung on to their "A Christmas to Remember" title after renaming Candace Cameron Bure's 2015 movie "A Christmas Detour," and then used ACTR for the Cameron Mathison movie in 2016. They could do the same thing with "Curveball," and use the title for another movie... especially one with some sort of baseball element to it. Hallmark loooooovvvvveeees Andrew, don't they? He has got to be their most popular actor. They are keeping him busy! I don't think the viewers mind. Andrew and Paul Greene are right up there at the top of the list of popular Hallmark actors. I can't argue with those choices (although I do hope that we have not lost Paul Campbell and Jonathan Scarfe forever, and that they will come back to do something for Hallmark in the near future -- there is room for everyone!). According to What's Filming?, it looks like Lisa Durupt and Nikki DeLoach will be joining Andrew Walker in "Safe at Home"! I must give credit where credit is due. Ruth (from the My Devotional Thoughts) website is going to be doing an interview with Lisa Durupt. Lisa told her that she is currently working on a movie with Andrew and Nikki. Ruth shared the info with our Hallmark fan group, but did not give the title of the movie. Since I discovered that Andrew is in "Safe At Home," when Ruth mentioned that Lisa was working with Andrew and Nikki again I knew that Nikki and Lisa must be in "Safe At Home" with Andrew. I gave the info to What's Filming, but Ruth is the one who gets credit for alerting us to Nikki and Lisa being in another movie together! I had no idea those 2 were in it until she said they were all working together. Thank you for sharing, Jill! 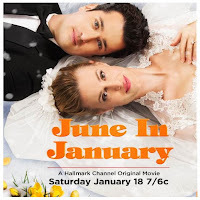 I shared the press release Hallmark sent me on the Jewel movie news - HERE! I found out their roles & description in Catherine Bell's Instagram. You are so sweet to share... Oh, and I posted this new cast news on my site - HERE! Oh, (oops!) thank you for letting me know, Jill! I thought that was still you! So sorry. Well, thank you then to Anonymous - for sharing the Instagram link! Why haven't we seen Autumn Resser or Sarah Lancaster in any Hallmark movies lately. Autumn was last Valentine's and Sarah's last movie I think was Along came a Nanny. Far to long not to see them in a Hallmark movie. Well... as for Autumn Reeser... she is quite busy according to her IMDB listing, unfortunately, on other non-Hallmark related projects. Hopefully, her schedule will open up somewhere and Hallmark can fit her into another project - hopefully Christmas!!! As for Sarah Lancaster, her last Hallmark movie was "Tis the Season for Love" - which aired on the Hallmark Channel during the 2015 Christmas season. Yes, it has been awhile since we have seen her, but she was expecting her second child during this last Christmas season and she gave birth to him about a month ago - on January 28th. This is her second son. I'm sure she is taking a little time off for now, but maybe - we will see her return later this year! Autumn knew she was working on the new series for E! But not my cup of tea so hope soon she finds time for Hallmark. Love every movie she has done for Hallmark my favorite will always be Love at the Thanksgiving Day Parade. They are my favorite Hallmark actresses along with Lacey Candace Alicia and Hilarie I am probably forgetting someone !! But I always know it will be a very good movie when I see one of those names!!! Sounds like we love much of the same Movies and Actresses, Anonymous!!! For me Autmn Reeser will never top Valentine Never After. Concrete Evidence: A Fixer Upper Mystery starring Jewel, A Fool and His Honey: An Aurora Teagarden Mystery with Candace Cameron Bure and Lifetime’s Tiny House of Terror start filming in British Columbia this week. Update 2/28/2017: The title has been changed to Concrete Evidence: A Fixer Upper Mystery (formerly Crowned & Moldering: A Fixer Upper Mystery) and the premiere date has been set for April 2nd. Concrete Evidence is the 2nd installment in the latest original movie series from Hallmark Movies and Mysteries, Fixer Upper Mysteries, starring Jewel. The first movie, Framed For Murder, filmed in British Columbia throughout last October and premiered on January 15th. Based on Kate Carlisle’s New York Times bestselling novel series, the Fixer Upper Mysteries revolve around Shannon Hughes (played by Jewel). Shannon is a professional when it comes to restoring old Victorian-style homes, but she also uses clues that she uncovers along the way to discover the truth behind unsolved mysteries. The series is set in the picturesque town of ‘Lighthouse Cove’, a fictitious town perfectly portrayed by Vancouver Island; the Victoria area in particular. According to an interview production manager Allen Lewis did with timescolonist.com, Concrete Evidence will feature a scene involving Shannon inside a dumbwaiter (freight elevator) dropping between floors in search of the movie’s antagonist. Concrete Evidence will be filming in Victoria and area until February 25th and is currently slated to premiere in April of 2017. In case you missed the first Fixer Upper Mystery movie, if you’re in the US you can catch it Friday, February 10th at 9pm on Hallmark Movies and Mysteries. After just wrapping up the 5th Aurora Teagarden movie, Dead Over Heels, a couple of weeks ago, production on movie number 6 began today. Titled A Fool and His Honey, the movie continues Hallmark’s movie adaptation of the popular novel series about Aurora Teagarden written by Charlaine Harris. In the novel version of A Fool and His Honey, an unexpected guest shows up at Aurora’s house with more than just baggage; she’s also carrying a dangerous secret. Naturally, Aurora is determined to figure out just what the girl is hiding, but in doing so she might find herself in deeper than she expected. A Fool and His Honey will be filming in British Columbia, primarily Abbotsford again, until February 24th. It may be a few months before we see this one air on Hallmark Movies and Mysteries, but don’t miss Dead Over Heels which airs Sunday, March 19th at 9pm. Lifetime continues to expand its original movie lineup with Tiny House of Terror. The story follows a woman who, after her husband mysteriously disappears, trades in her luxurious house for a tiny house in the middle of nowhere. Her dream home quickly becomes more of a nightmare. Toronto-born actress Nazneen Contractor (Heroes Reborn, 24, Star Trek: Into Darkness) and Francia Raisa (The Secret Life of the American Teenager) will star in the movie. Francia will play Sam, while Nazneen’s role hasn’t been revealed yet. According to the movie’s IMDb page, they will be joined by Jesse Hutch (Cedar Cove) as Kyle, Tammy Gillis (Unleashing Mr. Darcy) as Lindsay and Matt Bellefleur (The Romeo Section) as Mark – thank you Sherry for the heads up! Tiny House of Terror will be filming in Kelowna and area until February 24th. Brilliant, dedicated, and driven, archaeologist Emma Fielding finds things that have been lost for hundreds of years -- and she's very, very good at it. A soon-to-be-tenured professor, she has recently unearthed evidence of a seventeenth-century coastal Maine settlement that predates Jamestown, one of the most significant archaeological finds in years. “The Beach House is a beloved book for turtle volunteers as the story depicts a compelling mother-daughter reconciliation set against the loggerhead sea turtles that nest along our southeastern coast. The announcement for the film– especially with Andie MacDowell as Cara– will be met with great excitement. Andie knows that when I wrote the book, I had her in my head as Cara, so to see this film happen exactly as I pictured it is serendipity at its best,” said Mary Alice Monroe. “The Beach House” is Executive Produced by Andie MacDowell and Dan Wigutow (“Cedar Cove”). Sue Tenney (“Cedar Cove,” “Good Witch”) will adapt Mary Alice Monroe’s screenplay for television. Tenney will also serve as producer on the film. US cablenet Hallmark Channel is adapting Mary Alice Monroe novel The Beach House into an original TV movie starring Cedar Cove actress Andie MacDowell. The Beach House follows a woman who returns to her life in the US South after a request from her mother. Last week, Hallmark picked up repeats of Tim Allen sitcom Last Man Standing for its 2016 programming line-up. The movie, which will air exclusively on Hallmark in 2016, will star Andie MacDowell (Cedar Cove) who will also serve as executive producer. The story follows a woman struggling through life who returns to her Southern roots and troubled family after an unusual request from her mother. ‘The Beach House’ is a beloved book for turtle volunteers as the story depicts a compelling mother-daughter reconciliation set against the loggerhead sea turtles that nest along our southeastern coast. The announcement for the film– especially with Andie MacDowell as Cara– will be met with great excitement. Andie knows that when I wrote the book, I had her in my head as Cara, so to see this film happen exactly as I pictured it is serendipity at its best. Yes, I recall first hearing about this project - "The Beach House" starring Andie MacDowell in May of 2015. I reported on it then on my site - here. 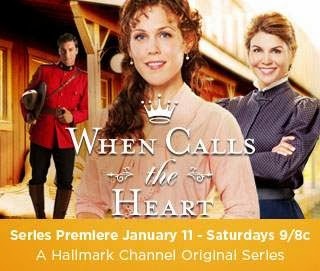 Plus, I was glad to share the update on this movie in Hallmark's January 2017 Press Release on my site - here. I appreciate you sharing. I know many are happy to see this movie project is finally coming into fruition. Thank you for sharing! There are only a few Garage Sale Mystery books, and yet there are a lot of those mystery movies on Hallmark Movies & Mysteries. So - I don't think it matters how many books there are. If Hallmark likes the cast, the stories, and (the biggest IF!) if it has great ratings - then they will produce more movies! And, yes - Courtney Thorne-Smith ("According to Jim," "Ally McBeal") will star as Emma Fielding in "Emma Fielding Mysteries!" Net -- I forgot to mention this a couple of weeks ago. ABC is behind the "Wonderful World" project, so it makes me think it is might be something under the Wonderful World of Disney banner. I don't know if the WW project will be an original story, or if it will be one of Disney's specials about all of the exciting changes happening in at the Disney parks (there are many), but since ABC is behind it I think there is a good chance of it being Disney-related. We'll see! Do you know who I would like to finally see play the lead character in a upcoming movie for Hallmark!!!! She has been in a lot of my favorite Hallmark movies but has always played the best friend. She always is so wonderful at those roles that I would just really like to see her as the main character for once. A Christmas Cop is adapted by Christmas Carol by Charles Dickens' novel. Nils Scroogeson is visited by 3 Christmas Cops; Ghost of Past Cop, Ghost of Present Cop, & Ghost of Yet to Come. It's Christmas Eve in Oslo, Norway, and vigilante cop Nils Scroogesen is in no mood to celebrate -- and you can take that to the bank. Wish upon a Christmas star with New York Times bestselling author Susan Mallery's sparkling Fool's Gold romance! To bridal boutique owner Madeline Krug, organizing a Christmas wedding sounds like a joy—until she finds out she'll be working closely with the gorgeous brother of the bride, movie star Jonny Blaze. How will a small-town girl like her keep from falling for the world's sexiest guy? Especially with mistletoe lurking around every corner! Jonny came to Fool's Gold looking for normal, not for love. Happily-ever-after only happens in the movies. Still, nothing about this quirky town is quite what he expected, and "ordinary" Madeline is the most extraordinary woman he's ever met. Refreshingly honest, disarmingly sweet. Achingly beautiful. Planning the perfect wedding leads to candlelit dinners and strolls through snow-covered streets. And Madeline finds Jonny in real life even more captivating than her celebrity crush. But will the action star be brave enough to risk his heart and step into the role of a lifetime? Could Hallmark make North Pole 3 - starring Bailee Madison this year? I hope Kaitlyn Maher could star in with Bailee. Will Hallmark Movies & Mysteries do Christmas Mysteries Movies based on the books? Will they make Murder, She Baked: Christmas Mystery Movies this year & beyond? Since they haven't make Christmas Mystery last year. The holidays are the icing on the cake for bakery owner Hannah Swensen. Surrounded by her loved ones, she has all the ingredients for a perfect Christmas--until murder is added to the mix. . . When it comes to holidays, Minnesotans rise to the occasion--and the little town of Lake Eden is baking up a storm with Hannah leading the way. The annual Christmas Buffet is the final test of the recipes Hannah has collected for the Lake Eden Holiday Buffet Cookbook. 'Tis the season for trimming the tree, caroling, baking cookies, and curling up by the Yuletide waiting for Santa to drop down the chimney. But in this festive collection of holiday whodunits, murder is also paying a visit. . . When a trail of candy canes leads to a corpse outfitted in a Santa suit on a snowy bank, Hannah Swensen sets out to discover who killed Kris Kringle. . . The yuletide season in Lake Eden, Minnesota, guarantees a white Christmas, delectable holiday goodies from Hannah Swensen's bakery, The Cookie Jar--and murder. As a shadow hangs over her friends' Christmas wedding, Hannah's determined to cook a killer's goose before anyone else gets burned. . . The Cookie Jar's busiest time of the year also happens to be the most wonderful time. . .for Christmas cookies, Hannah's own special plum pudding--and romance! She also gets a kick out of "Lunatic Larry Jaeger's Crazy Elf Christmas Tree Lot," a kitschy carnival taking place smack-dab in the middle of the village green. But then Hannah discovers the man himself dead as a doornail in his own office. . . Nothing's better on Christmas Eve than waiting for the stroke of midnight with a cup of eggnog and a plate of warm gingerbread cookies. But in this merry collection of holiday mysteries, murder is making its own special delivery. . . When Hannah Swensen finds her neighbor Ernie Kusak with his head bashed in and sprawled on the floor of his condo next to an upended box of Hannah's Gingerbread Cookies, she discovers a flurry of murder suspects that's as long as her holiday shopping list. I would say - it is certainly a possibility they could make any of the Hallmark Movies & Mysteries movies into Christmas movies this year! "Murder She Baked," of course, already had one with Plum Pudding, (which included the storyline with the Crazy Elf Christmas Tree Lot you mentioned above!) 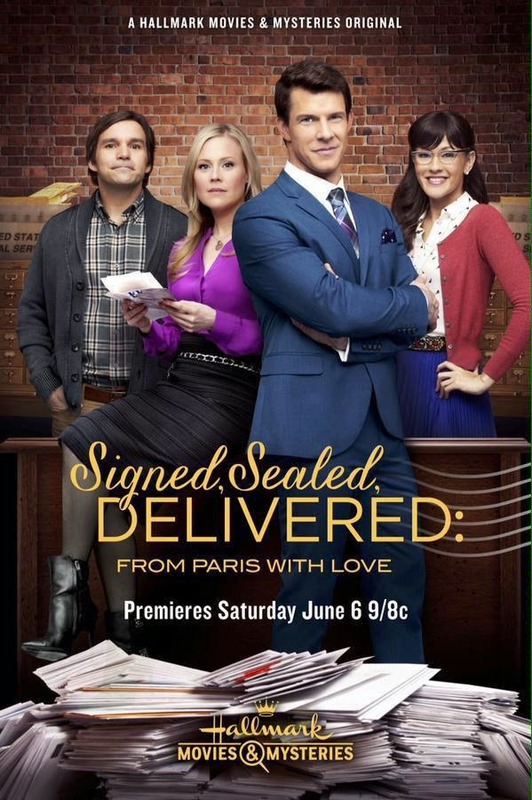 but I don't see why they couldn't or "Signed, Sealed, Delivered" for that matter, do another. I personally think it would be great to have any of the mysteries on Hallmark do a Christmas movie this year! Last spring I signed an option with a producer who wanted to make one of my books, The Convenient Groom, into a Hallmark movie. To say I was excited is an understatement. I tried to temper my enthusiasm. After all, a lot can happen between signing an option and the actual film debut. I’m friends with enough authors who’ve experienced the big letdown. I’d even experienced it once before myself. So I crossed my fingers, said a lot of prayers, and waited patiently. Okay, maybe not so patiently. Then in March I was notified that filming on The Convenient Groom was soon to begin. The movie was really happening! As I began sharing the news I found that writers and readers alike are curious about the book-to-movie process. So I thought I’d share a few things I’ve learned along the way. I’m sure there are many ways producers “find” novels. In my case it was through my publisher. The rights department actively pitches their novels for film rights. As it happens, this particular production company had already optioned a couple of other books and made them into Hallmark movies, so there was already an established history between my publisher and the production company. Yay for me! A celebrity relationship expert with a best-selling book about finding Mr. Right finds herself jilted just before her highly publicized wedding. In a panic she accepts the offer of a contractor—who secretly loves her—to step in as the groom in order to save her career. If you’re aiming for Hallmark it also doesn’t hurt to utilize one of the popular romance tropes. They’re popular for a reason. The Convenient Groom is, of course, a modern day marriage of convenience story. Unless your name is Nicholas Sparks or Nora Roberts, an author probably can’t expect to have much, if any, input in the film itself. Film is a completely different medium than a novel, and sometimes what works well in print doesn’t work at all on the screen. Fortunately I knew this up front, and was quite happy to let the film people work their magic. Along those lines, I’m often asked if I wrote the screenplay for the movie. Just like novel writing, screenwriting is a craft that takes years to hone. I wouldn’t know the first thing about writing a screenplay, and since I want “my” movie to turn out great . . . well, I’ll just leave it in the experts’ hands. Many books are optioned for movies, but few of them actually get made. There are a lot of steps between the movie option and the film premier, not the least of which is funding. It’s exciting to have a book optioned for a film, but you can’t really count on the movie happening until filming is underway. Getting a book turned into a TV movie is a slow process. I signed the movie option in March of 2015, and The Convenient Groom will air June 18, 2016. That may seem to fairly quick to you, but for an author waiting for her book to come alive on screen, it’s excruciatingly slow. And I was sworn to secrecy until the very end. It was hard to keep my exciting news to myself. A TV movie is also a quick process. While the matters of funding, screenwriting, and hiring actors and crew can take months, the actual filming of the movie is FAST. A Hallmark movie takes only about 3 weeks to film! Amazing. The cast and crew put in some long hours! Most Hallmark movies are filmed in and around Vancouver, Canada. The vast diversity of Vancouver’s landscape make for a perfect movie set, whether the movie is “set” in Nantucket (like mine) or New York. But the main reason many movies and TV series are filmed there has to do with cost. Canadian labor laws are much friendlier to the pocketbook than are the United States’. The Convenient Groom was one of my favorites that played during June Weddings 2016. Actually it was my second favorite. No lie!!! Before the Wedding March movie came on you had #1 spot for a week. I watched it when it premiered then again right after Summer Nights or before Octoberfest. So glad you posted this because was about to watch it again. Tomorrow was planning on going to the library before the snow comes.❄⛄❄ So now I know exactly what two books Iam getting. Hopefully they will have your book and also Joanne Fluke's book in because that is someone else who book to movies are great. Thanks again!! That is a good question, RG! You are referring to Hallmark's Christmas Bracket Challenge, right? I'm not sure why they chose the 64 they did. I also noticed they left out two of my favorites- "Signed, Sealed, Delivered: For Christmas" and "Murder She Baked: A Plum Pudding Mystery." And, yet, they included on the HMM list "A Christmas Wish" and "Our First Christmas," which were not HMM movies to begin with. It's a fun challenge, regardless, but I know exactly what you mean. I love "Matchmaker Santa," too!!! Another shocker not on the Christmas Bracket list - "The Most Wonderful Time of the Year" with Brooke Burns, Warren Christie, and Henry Winkler! I actually think that one could have been the ultimate winner, if it had been a choice. Can't believe they didn't include it - as I know it has been a favorite for many (myself included) for years!!! I don't know if anyone mentioned it on this blog yet, but I noticed two movies that were listed on What's Filming? that were mentioned on this blog as well. The first one is called "Love by the Book", which will be filming from March 27th to April 13th. If this movie were a Hallmark production, I'm guessing the title will change because they already have a movie with that exact same title. The second movie is called "The Art of Us" which is filming from March 26th to April 13th. I remember hearing about this movie on this blog, so it's exciting that this movie may be coming sooner than we expected! I'm kind of wondering if "Wild at Heart" and "The Art of Us" might become one movie with an art theme incorporated into it (like Hallmark did with "Love Locks")? Wild At Heart has nothing to do with The Art of Us. The Art of Us is author Teri Wilson's story (and it is supposed to involve art and dog walking, if the script has not changed). Wild At Heart is/was supposed to be a movie shot in Africa, starring Kristin Davis, about poaching. I noticed the listings for Love By the Book and The Art of Us, on Saturday. Nope, no one else had mentioned it, yet... but, I was thinking it when I added "Love by the Book" to the list above. Great minds! I really like the original Hallmark movie "Love by the Book," especially the Jane Austen "Emma" themes within it! Should be interesting to see if this new one is Hallmark, too. If so, they must not be aware of the other film with that same title. That is an interesting thought for "The Art of Us" and "Wild at Heart." As for "Wild at Heart," that movie is supposed to be set in Kenya and star Kristin Davis (A Heavenly Christmas). I am intrigued to hear more on both of these movies! Harper Higgins, art history professor and Vincent van Gogh scholar, doesn’t need a man. She needs an artist. Fast. The art show she’s counting on to secure her tenure is in trouble. So when she collides with a ruggedly handsome man carrying a basket of violets on a rainy night in Boston, she thinks she’s found her miracle. Cynical, brooding ex-soldier Tom Stone can paint. And he’s quite good. He just needs Harper’s artistic touch. Net -- I just wanted to mention something about an upcoming movie going into production. Remember how I was saying that I knew before "Safe At Home" or "12 Days" went into production that they would be Hallmark movies (although they had not been confirmed as such, I just knew)? I said the same thing about "Christmas Inheritance," which is supposed to be starting production now. I have a certain 'checklist,' let's call it, to determine whether or something is going to be a Hallmark movie. Some movies meet most of the items on the checklist, and some meet only a couple of things, which makes it harder to establish. "Safe At Home," "12 Days" and "Christmas Inheritance" all met the full criteria for being Hallmark movies before they went into production. So, now.... there is another one that I am going to say right now is a Hallmark movie. "Bridal Bootcamp" is going into production at the end of this month, and it meets all the criteria. It will be a Hallmark movie. Now, mind you, "Bridal Bootcamp" will probably have to receive a title change so it is not confused with your above-referenced "Bridal Boot Camp" (written and directed by Jake Helgren and listed on IMDB). They appear to be 2 totally separate movies!!!! But, whatever it ends up being called, we can safely say that "Bridal Bootcamp" is going to end up as part of June Weddings. Between "Love By the Book," "Love Finds Its Way" and "The Art of Us," I am going to guess that at least one of those movies will be the "in between themes" movie to premiere in May, since "Safe At Home" was thrown into Spring Fling. Possibly 2 of those titles will air in May. But I think that one of the titles will get a title change and end up premiering in June (either "Love Finds Its Way" or "Love By the Book," I would guess) as a wedding movie. Oh wow - those are two different movies! I agree - a name change or some addition to the title would (hopefully!) be required to clear up any confusion! But you never, since there are so many similar titles already, such as... "Wild Hearts," "Our Wild Hearts," Naughty or Nice," Naughty & Nice," and so on.. you get the point! All women want to look their best and feel great on their wedding day. Whether that includes losing weight or just toning up, this crash course in fitness is precisely what they need to really shine on one of the most important days of their lives. By following this easy-to-use, step-by-step program, they'll lose body fat, increase lean muscle mass, and make healthy, sustainable changes to their diets. Jump, stretch, bend, flex! Anyone can diet in time for their nuptials, but by following the regimen in Bridal Bootcamp, they'll be trim and glowing by the wedding day, and stay that way for years afterward. Included are six-month, three-month, and four-week regimens, as well as nutritional recommendations and a vitamin supplement program to help readers get and stay fit without sacrificing important dietary requirements. Bridal Bootcamp is fun, invigorating, flexible, and easy to do. 180 black-and-white photographs. I was just coming to post about Bridal Bootcamp which is currently in production to air on Hallmark in June. It's about a fitness instructor who helps brides get into shape. She finds herself falling in love with the fiance of one of her recruits. Awesome news! Bridal Bootcamp, as expected, is coming to Hallmark's June wedding event! It's not in production just yet. As I mentioned in my above post about it being a Hallmark movie (from 4 days ago), Bridal Bootcamp does not go into production until the end of this month. I don't know where this official information was posted today (I just got online right now and this was the first place I visited), but a lot of times they say in articles and press releases that things are currently in production when the movies are actually going to film in the somewhat near future. I mean.. I guess we can say that "The Beach House" is in production too, because someone from Hallmark indicated that it would air in June (on HMM). But it's not actually filming yet -- at least, not the last time I checked. They're probably in the pre-production phase right now (as Bridal Bootcamp would be). It's not filming yet, though. It's in pre-production, if anything. It doesn't start filming until the end of this month. The movie title is "Destination Wedding." Again, credit goes to Lisa C. for alerting me to all of this. Thank you, Sherry, for the movie details...that is fun news. I will be sure to add this new title to the above list! Thank you so much for sharing! SQuire Rushnell is a popular speaker and New York Times bestselling author whose books have coined the term “Godwink,” now in mainstream usage. Within more than one million books in print, SQuire’s Godwink stories are a popular monthly feature on the NBC Today Show. He also appears frequently on several national television programs including Fox News Channel’s Fox & Friends and recently was the cover story for CBS Sunday Morning. As a veteran ABC Television Network executive, he led Good Morning America to the number one spot and oversaw the acclaimed Schoolhouse Rock! series and the ABC Afterschool Specials. Programs under his direction have captured more than seventy-five Emmy Awards. For the 2017 season two Godwink movies are in pre-production for the Hallmark Channel. Thank you for sharing. You didn't mention the name, but I looked it up and it looks like it must be "Drama High" - which is a TV Movie Pilot for NBC. NBC is rounding out the cast for its drama pilot Drama High, from Friday Night Lights executive producer/showrunner Jason Katims and Jeffrey Seller, producer of the smash Broadway hit Hamilton. Shirley Rumierk, Joe Tippett, Ted Sutherland, and Taylor Richardson are set as series regulars opposite Josh Radnor, Auli’i Cravalho, in the project. Rumierk is Vanessa Suarez, a hard working, no nonsense complex single mother and waitress who wants the best for her daughter Lilette (Cravalho) even though at times her own behavior doesn’t live up to the standards she wishes she had for herself. Tippett will play Coach Doug Strickland, the high school’s football coach and Gwen’s father. Sutherland is Simon Saunders, the theatre’s leading man. Richardson will portray Kaitlin Mazzuchelli, Lou and Gail’s eldest daughter and a huge fan of theater and musicals. They join previously announced Shannon Purser, Rosie Perez, Damon J. Gillespie and Rarmian Newton. Katims and Michelle Lee executive produce via True Jack Productions. Seller and Flody Suarez also executive produce via Seller Suarez Productions. Universal TV is the studio. Rumierk most recently appeared in David Frankel’s Collateral Beauty for New Line opposite Michael Pena and will next be seen in the U.S. Marine drama, 11:55 opposite John Leguizamo and Elizabeth Rodriguez, set for release in June. She’s repped by Abrams Artists Agency and Authentic Talent & Literary Management. Tippett currently stars off-Broadway opposite Abigail Breslin in Erica Schmidt’s All the Fine Boys for the New Group and has guest-starred in Chicago Justice, Bull, The Blacklist and Boardwalk Empire. He’s repped by Paradigm and Perennial Entertainment. Sutherland will next be seen in a guest-starring role in HBO’s The Deuce and previously guest-starred in MTV’s Eye, NBC’S Law & Order: SVU. He’s repped by Paradigm. Richardson will next be seen in Stephan Rick’s The Super opposite Patrick John Flueger and Val Kilmer, and can also be seen in Adam Keleman’s upcoming feature Easy Living. She’s repped by Paradigm. A young surgeon with Savant syndrome is recruited into the pediatric surgical unit of a prestigious hospital. The question will arise: can a person who doesn't have the ability to relate to people actually save their lives? Sounds interesting. I added it to the list of TV movies under "Unknown Networks" above! Thank you for sharing this movie. I think "The Good Doctor" is going to be a tv show. The official status of this production is listed as "TV Pilot" on What's Filming?. In production; Filming in Vancouver/British Columbia on March 21st to April 6th. Written by House creator David Shore, the story follows Dr. Shaun Murphy, played by Bates Motel star Freddie Highmore. Dr. Murphy is a young, small town surgeon with autism who ends up becoming part of the pediatric department at San Jose St. Bonaventure Hospital. she is involved in the disappearance. Unfortunately, that article is from last January, 2016. I'm still hoping we will hear something on this Bruce Boxleitner mystery movie, but so far, there has been no news on it - this year! Tune in for four all-new Garage Sale Mystery movies coming to Hallmark Movies & Mysteries this August. Will Jennifer Love Hewitt direct or executive producer for Hallmark Channel movies? Will she star in for Hallmark Channel movies? Good question. That was announced as a possibility some time back. Only time will tell! I wonder if Rachael Leigh Cook seems want to solve a crime for Hallmark Movies & Mysteries. She could protrayed as Lucy Stone. Lucy Stone Mysteries books are based on the books by Leslie Meier. I love reading the Lucy Stone Mysteries, and I always thought that would be a good fit for Hallmark. I would to love to see that happen in the future. There are many Hallmark movies in production all at the same time -- at least 8 that I know of, and possibly more if there are movies filming in off-the-radar locations! Fortunately, press releases have come out about several of them (which you have posted here, Net), and those have cleared up the questions of who the lead actors are. 2. The movie with the working title of "Bridal Bootcamp" is now being referred to as "Ready Set Bride." Some of the stars of this movie include: Pascale Hutton, Kavan Smith, Anna Van Hooft and Debs Howard. Director Martin Wood is the one who is referring to it as "Ready Set Bride," but Anna Van Hooft referred to it as "Bridal Bootcamp." It's the same movie, though. Also, there was a press release for "All For Love," which you shared here, Net, but I just wanted to clarify that this is the same movie with the working title of "Love By the Book." I'm super excited about Pascale Hutton and Kavan Smith being in "Ready Set Bride!" They are both super cute together on "When Calls the Heart..." so, it will be fun to see them as different characters in modern time! I saw an on-the-set pic of them and "Destination Wedding" (which looks like a lot of fun!) and I updated the title above - for Ready Set Bride! I'm so glad they switched from Bridal Bootcamp, so there won't be any confusion with the title in the future. Still catching up after a busy week!!! Moving past the mystery/suspense genre to the mystical/religious, the network will present "When God Winks at You" in October. Kathie Lee Gifford is producing the movie, currently in production, with Squire Rushnell, who has authored nine best-selling "God Winks" books. They were both in attendance at the upfront dinner. Yes, I saw some pictures from the event on Twitter. Lacey Chabert and Danica McKellar were also there! That is an excellent question. I'm sure there are different reasons... they probably choose titles they think will appeal to the audience, relate best to the story, and be unique from other titles. There may also be copyright issues to deal with. So, who knows! Sometimes, we like the old title best and sometimes we like the new - it just depends. Again, great question! Mail Order Monster is a Halloween movie. Is Mail Order Monster is a sequel to Mail Order Bride? Shirley Bovshow at Hallmark Channel & Hallmark Movies & Mysteries @ Winter 2017 TCA Press Tour. Isn't she planning to do movie this year? I believe Shirley Bovshow was there, along with other members of Home & Family, to promote their morning show on the Hallmark Channel. Shirley does all the segments on plants, gardening, landscape design, etc... on Home & Family. I haven't heard any news of her being in a Hallmark movie. Yes, Hallmark released all these dates in their latest 'June Weddings' press release! 4 New Original Wedding themed movies have been confirmed!